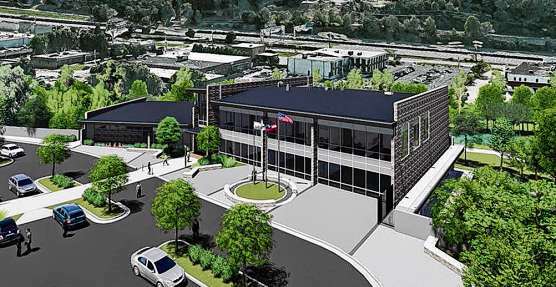 Brookhaven’s new public safety headquarters will bring its police department, municipal court and emergency operations center under one roof. Built on a 19-acre tract of land adjacent to the Peachtree Creek Greenway, the building will aim to be “as eco-friendly as possible,” the city said in a statement last week. It will utilize Leadership in Energy and Environmental Design (LEED) concepts and be twice the size of the current police headquarters. Final design renderings for the building were recently presented to the Brookhaven City Council, and show off the large, multi-story structure. It’s expected to open in the first half of 2021. The building will overlook the Peachtree Creek Greenway, part of which is currently under construction. The city paid Rosser International Inc. for architecture and engineering services on the new building. The city has not yet put a bid out for construction of the new HQ, but set a planning budget of $15 million, City Manager Christian Sigman said. The police department is outgrowing its current HQ on Buford Highway, the city said last year.